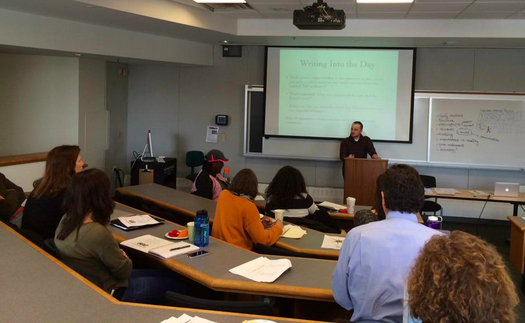 Finally catching a break from the weekend snowstorms that have plagued Connecticut this winter, the Connecticut Writing Project (CWP) at Fairfield University hosted a session of the Assignments Matter National Task Jam on Saturday, February 21. The CWP morning seminar gave 25 educators a chance to collaborate and to design high-quality, engaging writing assignments for the Assignments Matters Google+ Community Their created tasks will be posted alongside the assignments by already created in January by 475 middle and high school educators throughout the country. This National Writing Project (NWP) initiative is funded by the Bill and Melinda Gates Foundation, as “a collaborative, knowledge-building and sharing experience open to any teacher who knows that meaningful tasks create powerful results.” This Gates Education Foundation provided grants that allowed teachers nationwide an opportunity to develop writing tasks that can be shared through NWP collaborative platforms. Write about a time where you gave a task to someone and the result was not what you wanted. What happened? What was the purpose of the task and the desired result? “Take out your notebooks and go to the back”…I said to the class. I looked down for the markers on the bottom of the overhead cart. I saw students mid-way out of their seats stiffen. “You said go to the back….”, stammered one of the boys. I need to be clear and specific when I give directions. That lesson in clarity has stayed with me in my teaching career, and based on the examples given by other teachers in their responses, there was mutual agreement on the importance of clarity in giving directions-written and spoken-in teaching. The afternoon session was dedicated to the development of writing prompts that teachers could use in their classrooms. Teachers were encouraged to use templates provided by the Literacy Design Collaborative. The opportunity to revise and to share new prompts with other teacher participants brought immediate satisfaction. The knowledge that these prompts will be shared with teachers across the country throughout the school year was gratifying as well. These prompts are a clear demonstration that while #taskmatters, the role of the teacher in crafting writing prompts as assessments that address the needs of their student populations is critical. These prompts are not “canned” curriculum prompts. They are proof that in in creating assessments #teachersmatter. Thank you, Bryan Crandall, for hosting; thank you, Shaun Mitchell, for facilitating!